Preview of Bourlekrane, with camera bag and pencil on the road to Morocco, 18 June 1925, les petits bonshommes. 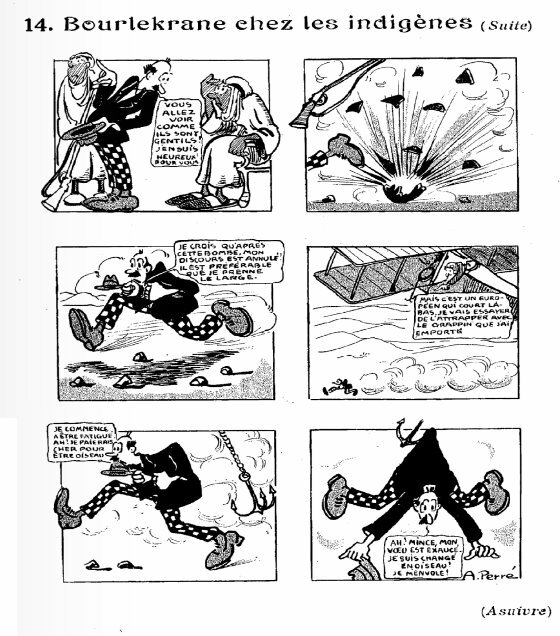 Artist-writer Aristide Perré (1888-1958) made several strips for this magazine in the early 1920s. 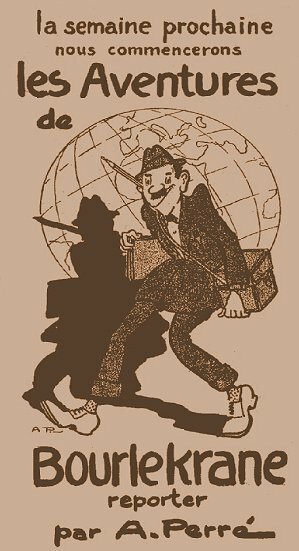 Mildly humorous stories in a seemingly primitive but effective bigfoot and silly walk style. 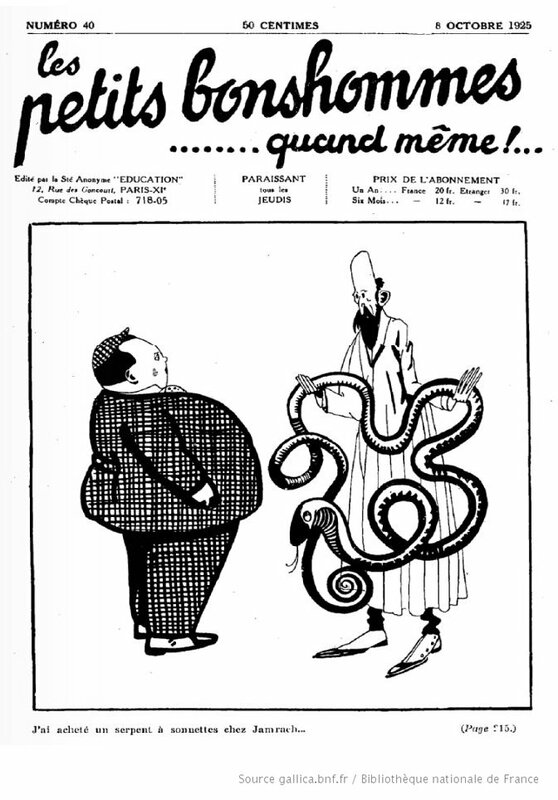 Cover of les petits bonshommes, 8 October 1925. Strips such as the adventures of Bourlekrane, reporter of Le Petit Bobard, for which the first announcement appeared in print in les petits bonhommes of 18 June 1925. The French ‘bobard’ means little lie. 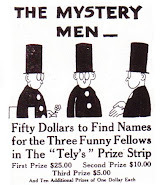 The French ‘boule crane’ means ball skull, although that may have nothing to do with the name of the comic character. A similar 1920s reporter featuring in comic strip adventures was Tintin, reporter of Le Petit Vingtième, created by Hergé (1907-83) on 4 January 1929. 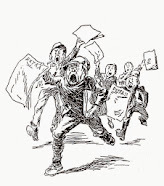 Belgian reporter Tintin (short for ‘Valentin’) started his career as primitive as his French colleague Bourlekrane. 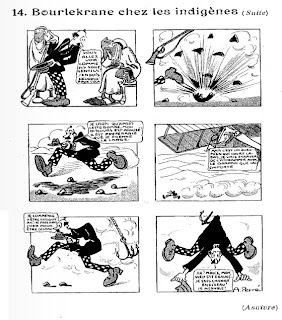 The strip appeared on Thursdays too, in Le Petit Vingtième, the weekly children’s supplement of a small Brussels newspaper, Le Vingtième Siècle (the twentieth century). 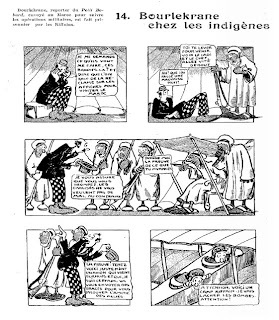 Bourlekrane chez les indigènes (Suite). “In fact, “Bourlekrane” is just a name constructed about “bourre le crâne”, and this expression means something like “brainwashing”. For instance, someone who tell (or write) false facts, but so well that many people finally believe what he says.